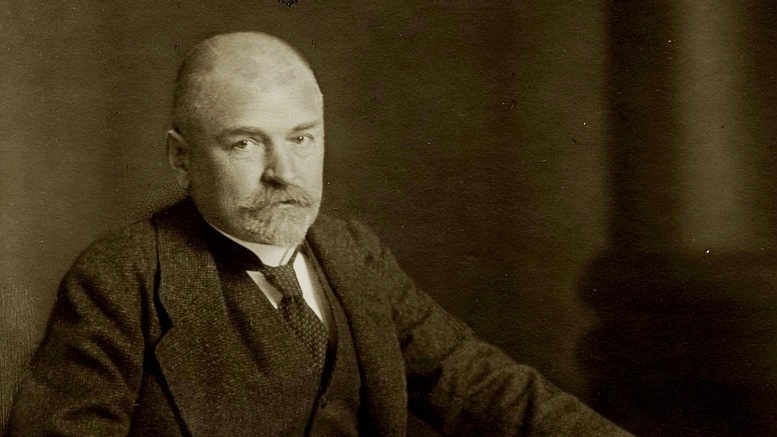 Ottokar Mascha was the first in Austria to deal with the subject of “Posters”, not only as a skilled collector, but also as a well-informed publicist. An impressive product of this profound and professional passion for collecting was a 436 page comprehensive work about Félicien Rops published by Mascha in 1910. This presented an accurately described directory of the artist’s work.6 The book was published with a print run of 500 consecutively numbered copies and is still regarded today as an internationally sought-after standard work on the oeuvre of the Belgian artist. At the same time, Ottokar Mascha built up an extensive collection of Austrian poster art long before the public institutes launched their own similar initiatives. In 1912 Mascha made a significant part of his collection available for the first representative poster exhibition in Austria. This exhibition drew much attention at the time and took place in the Vienna Secession. Mascha provided a well-researched article for the show’s catalogue. Parts of his collection and those of the architect Otto Polak were exhibited and original designs were offered for sale. In the process, successful international trends were made accessible to the Viennese public and so, as a result, for the first time in Austria tributes were paid to the works of Julius Klinger from Berlin. However, despite his great dedication to the show, Mascha remained critical and distant in relation to the project’s implementation: The Vereinigung bildender Künstler (Union of Austrian Artists) essentially went to great lengths to provide no platform for unwelcome competition. It was noticeable, as a result, that apart from a few examples by Kolo Moser and Alfred Roller, the representatives of the Klimt group, who left the Secession in 1905, did not feature – even though their main focus actually was in the area of applied art in particular. It was in this year, 1917, that Ottokar Mascha donated the bulk of this poster collection to the Kupferstichsammlung (Engraving Collection) of the Imperial Court Library of the time, “with the intention that this collection, which is associated with my name, might bring glory to the fatherland and benefit posterity.”19 In doing so, he created the stimulus and the basis for the Austrian National Library’s outstanding poster collection. The main element of his legacy, that is to say the valuable art posters, found their way after the war to the Albertina in the course of the transfer of the Kupferstichsammlung from the National Library and, here again formed the basis of the collection of applied graphic art in this prestigious institution. In keeping with the zeitgeist, Ottokar Mascha further donated an extensive selection on the subject of “war art” to the National Library, which also contained 154 international posters, 830 war postcards, art and memorial prints, as well as caricatures on the subject of the Great War.23 Following 1918, only this collection of items remained in the National Library as it was. For this generous donation Dr. Mascha received the “Orden der Eisernen Krone 3. Klasse” (The Order of the Iron Crown, 3rd Class). After the death of his wife Sofie on 2nd January 1926, Ottokar Mascha died as a result of his illness in Vienna in the Auersperg Sanatorium on 9th February 1929.31 On 12th February he was buried in Vienna’s Central Cemetery in group 122, row 15, number 4.32 Since then, Ottokar Mascha has been ever present in the relevant literature on posters right through to the internet age; by contrast extremely little has been known up to now about the life of the person who had such significance for Austrian cultural life. Denscher, Bernhard: Ottokar Mascha, a Viennese Connoisseur, in: Le Coultre, Martijn F. (ed. ): Hans Sachs and the Poster Revolution, Dutch Poster Museum, Hoorn 2013, p. 41-43 (Updated version). 1 Vienna City and Regional Archive, Totenbeschau (post mortem inspection) J.A. 4206/1929. The author extends his thanks to Dr. Klaralinda Ma-Kircher and Dr. Karl Fischer from the archive for their kind and valuable assistance. 2 From 1891 to 1896 Mascha was registered as a lawyer at the ‘noble’ Prague address I, na Přikopě 15, according to “Leser, Vaclav: Adressar kralovskeho hlavino mesta Prahy, Praha 1891/1996”. 3 Koschatzky, Walter: Introduction in: Kossatz, Horst-Herbert: Ornamentale Plakatkunst. Wiener Jugendstil (Decorative Poster Art. Viennese Art Nouveau) 1897 – 1914. p. 5. According to the Viennese directory Lehmanns Wohnungsanzeiger Mascha’s address from 1897 to 1929 was Vienna XIII, Wambachergasse 14, according to the registration documents at the Vienna City and Regional Archive he was officially registered there from 1903 – 1929. 4 Vienna City and Regional Archive, historical registration documents. 6 Félicien Rops and his work. Catalogue of his paintings, original drawings, lithographs, etchings, soft-ground etchings, dry point etchings, heliogravure etc., and reproductions, Munich 1910; Online http://www.archive.org/details/flicienropsund00mascuoft (version dated 1.6.2013). 7 Österreichische Volkszeitung, 19.2.1929, p.6. 8 http://www.graphische.at/direktion/organisation/sammlung/plakate/plakate.php?cat=&bereich=&we_lv_start_0=0 (version dated 1.6.2013). 9 Mascha, Ottokar: Künstlerplakate und Plakatkünstler, in: Internationale Sammler-Zeitung, 1913/17, p. 250. 10 Falmbigl, Marlene: Bücher sammeln aus Leidenschaft – Privatbibliotheken in Wien um 1900 , Thesis, Vienna 2009, p. 46; online: http://www.buchforschung.at/pdf/Falmbigl.pdf (version dated 1.6.2013). 11 compare: Grohnert, René: Hans Sachs und seine Plakatsammlung, der Verein der Plakatfreunde und die Zeitschrift „Das Plakat“ im Prozess der Herausbildung, Bedeutungswandlung und Konsolidierung des Plakates in Deutschland zwischen 1890 und 1933, Diplomarbeit, Berlin/Neersen 1993. 13 Das Plakat:1914/1, p.60; 1914/4, p.175; 1915/3, p.127; 1915/3, p.129; 1915/5, p.201; 1916/1, p.59; 1916/3, p.152; 1916/5-6, p.267;1917/1, S.61; 1917/2, p.126; 1917/2, p.135; 1917/4, p.226; 1917/5-6, p.246; 1917/5-6, p.249; 1918/1; p.50; 1918/5-6, p.219; 1918/5-6, p.229. 14 Das Plakat: 1912/3, p.1. 15 Mascha, Ottokar: Österreichische Plakatkunst, Vienna 1915. 16 Feigl, Hans (ed. ): Deutscher Bibliophilen-Kalender für das Jahr 1916, p. 103 ff. 17 Sachs, Hans: Oesterreichische Plakatsammlung von Dr. Ottokar Mascha, in: Das Plakat 1915, p. 198 – 204. 18 Sachs, Hans: Die Plakatsammlung Mascha), in: Das Plakat 1917/4, p. 226. 19 Jobst-Rieder, Marianne: Die Kriegssammlung der k.k. Hofbibliothek , in: Jobst-Rieder, Marianne – Alfred Pfabigan – Manfred Wagner: Das letzte Vivat. Plakate und Parolen aus der Kriegssammlung der k.k. Hofbibliothek Wien , Vienna, 1995, p.13. 22 http://www.onb.ac.at/koop-poster/explore/#wien (version dated 1.6.2013). 24 Amsler & Ruthhardt, Catalogue XCVIII, Oscar von zur Mühlen collections, St. Petersburg. Graf Gregor Stroganoff, Rome. Dr. Ottokar Mascha, Vienna, Berlin 1914. 25 Sammlung Dr. Ottokar Mascha – Wien, F.A.C Prestel, Frankfurt 1918 (=auction 69). 26 Vente Publique et aux Enchères… de Félicien Rops, Galerie Giroux, Bruxelles 1921; Online: http://www.archive.org/details/ventepubliqueeta00mascuoft (version dated 1.6.2013). 27 Handbücher der Reklamekunst. Die Sammlung angewandter Graphik, 1919. 28 Wiener Stadt- und Landesarchiv, Verlassenschaftsabhandlung des Bezirksgerichts Hietzing (Vienna City and Regional Archive, Hietzing District Court Probate Proceedings) 2 A 228/29. 29 For example in 2006 a poster by Toulouse-Lautrec which contained Mascha’s ownership seal was sold at “Ketterer Kunst”, http://www.kettererkunst.de/kunst/kd/details.php?obnr=100600300&anummer=300 (version dated 1.6.2013). 30 I would like to thank Mr René Grohnert for this reference. 31 Vienna City and Regional Archive, Totenbeschau (post mortem inspection) J.A. 4206/1929. 32 Obituary notice, Neue Freie Presse, 10.2.1929, p. 28.